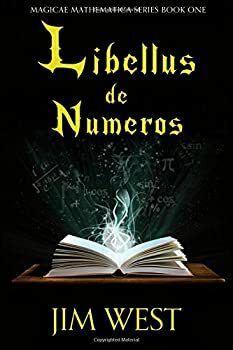 Libellus de Numeros by Jim West is a self-published well-intentioned earnest debut middle-grade novel that reads, well, like a self-published well-intentioned earnest debut middle-grade novel. One certainly can’t quibble with its goal, presenting young readers — especially girls — with an engaging fantasy tale that incorporates math into its plot so that the audience might become more interested in mathematics, as well as believe that they too can “do” math (and that they can also be the hero of their own lives). Unfortunately, good intentions do not a well-crafted book make, and though it pains me to say, while Libellus de Numeros might be engaging enough for very young audiences, there are so many more better written novels out there that it’s difficult to recommend. The plot, as mentioned, is simple. There’s next to no world-building, with little sense of the City beyond the fact that it has a too-familiar corrupt leadership right out of central casting, as is the school bully with a potential good side that Alex has to deal with. The two villains, meanwhile, are given only a modicum of development, and as with those in the city, little sense of their existence or their world is evident beyond what drives the basic plot. A few good emotional moments surround the lead Guardian, but his arc moves in wholly predictable fashion. Prose, structure, and dialogue, meanwhile, shift mostly between serviceable and clunky/awkward, characters speaking far too often as if they live in our modern world. Finally, for all the intention of making math interesting, there’s surprisingly little math instruction/engagement here, despite being frequently mentioned (the ease and arbitrariness of the magic is another issue). One can’t fault Lewis for his goal here, but the execution of Libellus de Numeros is lacking for all but the least discerning young reader. Those, as mentioned, may find it engaging enough, but they’d be better off pointed in other directions, such as toward works by Matthew Kirby or Suzanne Collins’ Middle Grade series GREGOR the Overlander. I really like the math idea here, and if this is an indie book, it may be relatively early in this writer’s development. There is lots of room to improve craft as he continues to write. Yes, and I actually have book two and will eventually get to it. So I’ll let you (and everyone else) know if there was improvement. Right now, as mentioned, it’s tough to recommend, despite how much I like the premise and the intent. But a strong book two can certainly change things around! Thanks for the read and review! Marion said it best. LdN was my first book, and I shaped up significantly for the second book, Circulus de Potentia, and recently released the 3rd in the 4 book series. I look forward to your thoughts on CdP when you do get to reading it. I feel it is a improvement. Love your reviews on the site btw. Hi Bill. Hope you get a chance to read CdP. Love to hear if I made improvements to the story.